check, check and check! Whew! That feels good! Meredith left a comment on that post "...Boston is the celebration of putting in the hard work to get there"
And before that, Kelly had mentioned to me that all things, even strange injuries, happen for a reason. Because I knew I most likely would not be able to run my goal pace at Boston, this seemed like the perfect way to approach the race. Boston Marathon was like no other race experience I have ever had. People tell you before you race it how special it is... they tell these stories of crowd support that seem that they must be tall tales... and then you get there and it's all 100% true! Alex picked me up at the airport on Friday (he had driven up from work in CT for the weekend). I was on a flight with good friends, Brett and Leslie. Brett was ready to have a great race in Boston and was noticeably anxious to get going. Since I was coming up with absolutely no expectations, I realized I'd never been so relaxed before a race. That being said, I was still hoping for a miracle. My last chiropractic adjustment on Monday had dramatically lessened the pain under my left heel, giving me hope that I might be able to run pain free on race day. Dinner out on Saturday night with my Rev3 Teammates made it the perfect day. I love this team, such awesome people!! Always good to see Jamie and Sam, and I finally got to meet Jordan! On Sunday we WALKED (loved that about boston!!!) to the home of a friend of mine from college. It had been 10 years since I'd seen him!!! Crazy!! It was a lovely relaxing way to spend the morning the day before the race. It puts things into perspective to spend time with people outside of the triathlon/140.6 community. At one point he said, "I see these thing you post on Facebook, and I think 'that's just crazy!' But the crazier part is that it's clear from the comments that folks leave, that these things are perfectly normal to them." It's true, we start to forget that completing the 140.6 or even the 26.2 is an unfathomable accomplishment to some. I always tell people, finishing a half marathon used to be unfathomable to me... you just start our with 5k and sprint triathlons and build from there. I honestly didn't know what to expect of the day... I woke up feeling apprehensive for the first time about the task that lay ahead of me. Let's face it, the training I'd put in was not ideal... I hadn't had a run without pain since January. I hadn't run faster than 9:00 pace since February... and my longest run (other than the 30 miles I walked/ran "pacing" Dani at her double) had been 17 miles back in February (8 weeks before the race), a leisurely "recovery" day with Andree. I'd been running in the water but not as consistently as I should have been to really make a go of this day. I've been busy with work and made the decision after my aborted run mentioned in the previous post, to just do what I could to finish Boston and focus on work. Starting a business and training for a marathon were just not compatible for me at this time. So as I boarded the bus outside of Boston Commons to head to Hopkinton my mind was decidedly on the task at hand. I met Nicole standing in line, a stranger who turned out to be a great person and exactly who I needed to hang out with before the race. Nicole was excited to race, she'd had great training behind her and was really ready to go! With all of that though, she was very relaxed, easy going and since this was her 2nd Boston, full of good information for me! We hung out in the athletes village until it was time for her to head to her corral. Me and Nicole in the athletes village before the race! Doesn't it look like we've known each other forever? that's what it felt like!! Great to find a new friend! When they called my start corral, I headed (or should I say herded) to the clothes drop off with everyone else. We got bottlenecked and by the time I dropped off my clothes I had mere minutes to make it to the starting line! It was a bit nerve wracking!! As I approached my start corral (jogging so that I could make it in time) like a mirage I see Mike waiting for me at the entrance of the corral! In the first of many "over the top" greetings I had that day... or maybe the entire weekend since I'm pretty sure I did a little dance when I found Jamie and Sam at dinner on Saturday night... I gave Mike a huge hug and about 10 seconds later the cannon went BOOM! It took about 4 min for us to actually make it to the start line and in that time Mike cleared up the game plan of the day... I'd made a reference to him a few weeks before that I wanted to go 3:30 so that I could qualify again with a good enough time to register for the race before it filled. Based on the runs I'd done in training, if my leg/hip held up this was a fairly reasonable goal. What I didn't know was how I'd feel after 17 miles (my longest run) or how long my leg would hold on.... so since I was trying to BQ, if Mike started to feel bad, but I felt good, I was to go ahead; but if I started to feel bad, he was going to stick with me... THANK GOODNESS :D because I started to feel bad around mile 3. We were able to hold 8:00 pace (right on 3:30 goal time) for the first 8 miles... Mike's race report is a fabulous recreation of our day out there... Almost to the point where I hesitated to write mine at all... I was just going to link to his... but then I wouldn't have the chance to write about how amazing Mike was as my sherpa! Love this photo of all the cups in the ground... by the time I went through the water stations they were 6" deep!! As I said, around mile 3 is when my hip started to twinge... and shortly after that pain under my heel and at the top of my hamstring... my biggest concern was doing any serious damage to my leg... I was concerned about muscle tear, tendons, etc. So I started to favor my left leg, really just moving it through the motions... Luckily Boston and mostly downhill in the beginning (you hear people say this, but you don't really believe it until you get there... it is VERY downhill) so it was pretty easy to just swing my leg through... the only difficult parts were the uphills... these were the times that I really needed Mike... I had him tell me stories about anything and everything... I don't even know if half of them were true... when we ran through Natick (I think) he told me about a guy in school, Naked Ned from Natik or something like that... he used to come to every party naked and it was no big deal after awhile... then one day he got pulled over coming home from a party... yep, he was naked... and they didn't see him much after that. So as you can imagine... yes, I was in serious pain, and yes, it was damn hot out there... but really it wasn't so bad, I've never had 4:15 go by so quickly. So thanks Mike, seriously, I wouldn't have finished in 4:15 without you!!! "Let's turn this into a party"
I think it was around mile 9 or 10... that point in the marathon that if you are already feeling bad the idea of running the rest of it starts to feel a little insurmountable... so I turned to Mike and said "I'm about ready to turn this thing into a party!" what did that mean??? It ment, we were going to have the quintessential Boston Marathon experience!! We were high-fiveing as many people as we could, we were kissing girls in Wellesley (no were weren't, who said that!?!?! 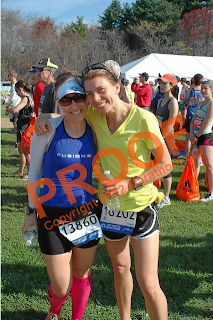 ), we were getting pushed up the hill by the drunk, I mean, enthusiastic, college guys at Boston College... and we were going to tick off my goals (running heartbreak hill, seeing the Citgo sign, and crossing the finish line). If I hadn't been in the situation that I was in going in to boston... if my training had gone to plan and I was really going to race it... I wouldn't have taken the time to do these things. So from that standpoint, I am grateful!! Grateful to have had the opportunity to really soak it all in, the chaos, the screaming, the fan support, the craziness of it all! I've never experienced anything like it, and I don't know if I ever will again. Grateful for all of the folks we had along the way (our mini-goals), Mike's Dad at mile 16, Heartbreak hill at mile 20 - where Jordan and the RaceMenu crew were a welcome site with their ice cold sponges!! When I saw Jordan I hugged him like he was a lost soldier returning home - yeah, I'd met him two nights before, but he's a Rev3 teammate, so it's like he's family! ), looking for Alex starting at mile 22 and not seeing him until mile 25 - scanning the crowd really keeps your mind off the pain), TJ and Alex at the top of the hill at Mile 25, so happy to get a chance to see Alex out there!! And speaking of soldiers returning home... Mike is right I was tearing up under the cover of my sunglasses, but it wasn't from pain... it was only when I saw the soliders hiking the 26.2 with their full rucksacks and one with a sign on his back regarding a fallen comrade who would "never be forgotten" and I wanted to hug every single one of those guys. They are my heros and my heart aches for them and the pain of war and lost friends. and I am grateful to them for keeping it all in perspective. I am grateful to have had Mike there by my side, to remind me to go high-five some kids on the side of the road, to fight over grape flavor flav-o-ice popcicles with, to point out the huge crowds during the last mile of the race (40-50 people deep for a mile for a RUNNING race!! crazy!!! ), to keep me fighting till the bitter end, and all the high five's along the way. We turned it into a 26.2 mile party! A celebration of life and accomplishment. Mike continues his shepherding ways and ran a 5k this past weekend with his daughter. Very impressive considering he has a massive infection in his left shin! and for me? I'm doing exactly what I said I'd do at the end of my last post... I've pulled out of all the races I had on my schedule for 2012. I will be volunteering instead at as many Rev3 events as possible. I sat down with Dr. Pam and coach Laura and put together a 1 month plan to get the muscles supporting my hips and core stripped down and rebuilt in a more balanced fashion. I have faith that I'll be back to running and biking soon. A big thank you to my mom and dad for staying with my boys from Friday until Tuesday!! It's a tough run with after-school activities, lunches to pack, etc. They were awesome!! Thanks to my kids for being excited for me and cheering me on. Thanks to Dr. Pam, Eileen Steil, and the folks at Synergy Release Sports for all banding together to figure out my problem and doing their best to get me to the start and finish of this race. As always a huge thanks to my coach, who worked WITH me when everything started going pear shaped! Thank you Laura for always believing in me and never letting me give up. I loved the hand written note she sent me before the race that said "You don't need luck, you've got you!" it was the perfect reminder that I finish what I start. So damn true. What an awesome experience. I wish I still lived there to cheer everyone on. Way to play it smart and "have a party" b/c who doesn't like a 26.2 mile party! Thanks for the shout out! I think you did great. Boston is a beast with or without the weather; with or without the injury. A 4:15 is a great time regardless. I am glad you enjoyed your experience. Now go rest and heal up! Wonderful report! I am so proud of you! You will be drawing on these amazing memories as you get stronger and balanced for next year. Jill, what a great way to experience your first Boston! I took a similar approach this year and just threw a time goal out and I had a blast. So cool that you got to experience it, had a "tour guide" and got to see friends along the way. I've been stalking your blog for awhile and thought I'd finally say hi! Congrats on Boston...and I can't wait to hear more about your adventure. Thanks for all you share! YOu are an amazing writer! I always enjoy your blog!